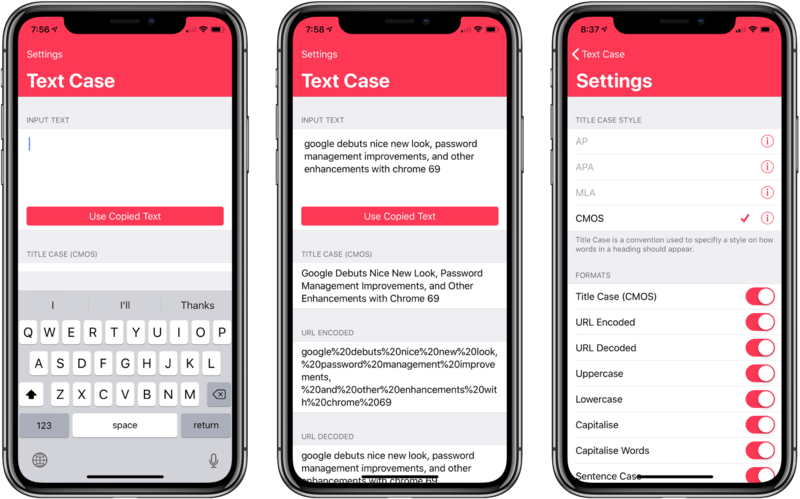 Not long ago, I reviewed an update to a new text transformation utility for iOS by Chris Hannah called Text Case. That update added support for title casing text according to popular style guides including the Chicago Manual of Style that we use here at MacStories. The app can do 13 other text transformations too like URL encoding and decoding, all caps, sentence capitalization, and many more. I have the title casing rules of the style guide internalized for the most part, but every now and I want to check on a headline to be sure. In the past, I used an online service, which works well, but switching to a browser is an interruption. It’s a small interruption, but it’s one that may lead me to check another open tab or do something else that distracts me from completing an article. When I’m writing, I’d rather stay immersed in my text editor. With Text Case’s extension, I can run a headline conversion right inside my text editor from the share sheet that’s accessible from the contextual popup menu that appears when you select text. With version 1.3 out today, Hannah takes the app a step further by adding Siri Shortcut support too. 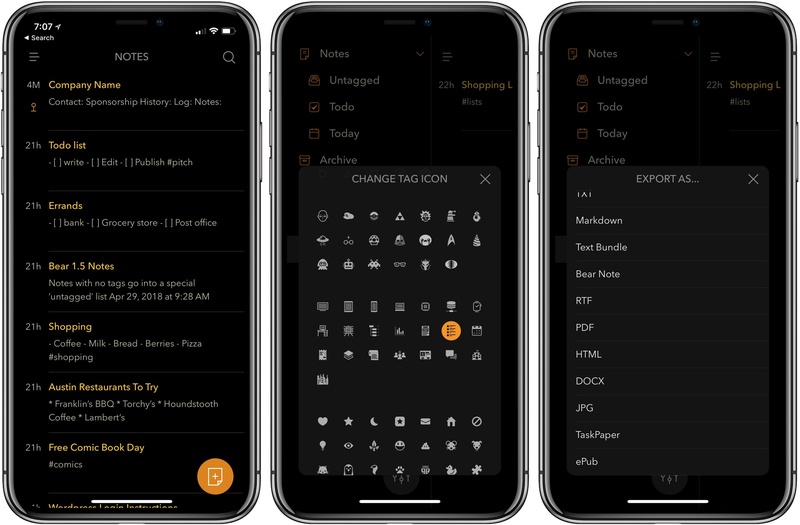 Several weeks ago I mentioned Chris Hannah’s recently-released iOS text transformation utility Text Case in the Club MacStories weekly newsletter. The app has a simple, utilitarian design that uses the big, bold header text popularized by Apple apps like News and Music. Version 1.0 included a long list of built-in text transformations. Some, like URL encoding and decoding, are useful, and others, like ‘Mocking SpongeBob,’ are just for fun. By and large though, the transformations in version 1.0 were geared more towards developers than writers. That’s changed with version 1.2 of the app, which should make it appeal to a wider audience. The latest update adds Title Case, which can transform headlines according to the style guides for the Associated Press, American Psychology Association, Modern Language Association, or Chicago Manual of Style. The update also adds sentence case and Pascal case. 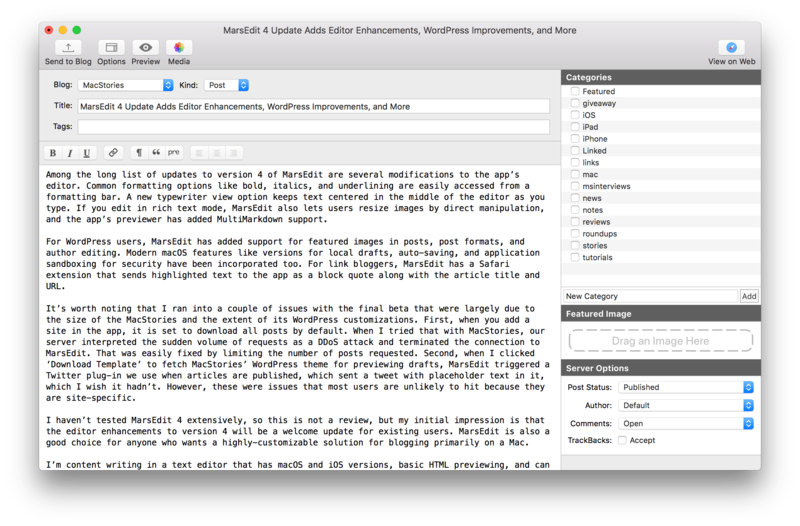 MarsEdit, Red Sweater Software’s macOS blog editor, received a major update today with new features and a UI refresh. Among the long list of updates to version 4 of MarsEdit are several modifications to the app’s editor. Common formatting options like bold, italics, and underlining are easily accessed from a formatting bar. A new typewriter view option keeps text centered in the middle of the editor as you type. If you edit in rich text mode, MarsEdit also lets users resize images by direct manipulation, and the app’s previewer has added MultiMarkdown support. For WordPress users, MarsEdit has added support for featured images in posts, post formats, and author editing. Modern macOS features like versions for local drafts, auto-saving, and application sandboxing for security have been incorporated too. For link bloggers, MarsEdit has a Safari extension that sends highlighted text to the app as a block quote along with the article title and URL. Research is an inherently messy, non-linear process. In a traditional note-taking app, text, links, and images quickly wind up a disorganized mess, and moving items around with cut and paste is cumbersome. 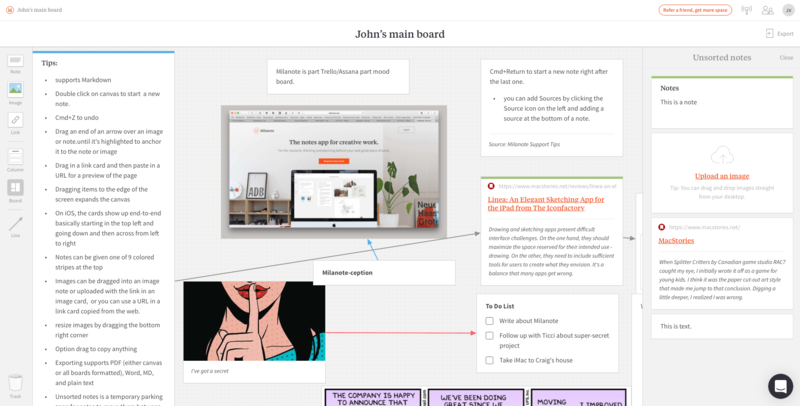 Milanote is a free-form note-taking web app designed to bring order to the chaos.